The delta in Jezero crater, a past lake on Mars. Ancient rivers ferried clay-like minerals (shown in green) into the lake, forming the delta. The clays then were trapped by rocks (purple). 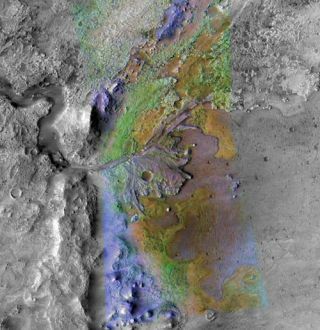 A lot more Martianrocks were altered by water than scientists originally thought, suggesting thatearly Mars was a very wet place. Newobservations made by NASA's Mars Reconnaissance Orbiter (MRO), currentlycircling the planet, have revealed evidence that vast regions of the southernhighlands of Mars were altered by water in a variety of environments billionsof years ago. Water is a key condition for life as we know it. Though there is no firm evidence that Mars has ever harbored life, knowing that the planet was once wet suggests that it was at least habitable in the past. The key tothe finding is the discovery that rocks called phyllosilicates are widespreadon at least the planet's southern hemisphere. The waterpresent on Mars from about 4.6 billion to 3.8 billion years ago transformedsome rocks into these phyllosilicates, which include clays rich in iron,magnesium or aluminum, mica, and kaolinite (an ingredient in Kaopectate). "In aphyllosilicate, the atoms are stacked up into layers, and all of thephyllosilicates have some sort of water or hydroxyl [oxygen and hydrogen group]incorporated into the crystal structure," said study team member ScottMurchie of Johns Hopkins University. Previous datafrom an instrument called OMEGA - Observatoire pour la Mineralogie, l'Eau, lesGlaces et l'Activite on the Mars Express spacecraft had revealed only a few largeoutcrops of phyllosilicates, suggesting they were a relative rarity onMars. "Itsort of gave the false impression that rocks that were altered like this weremore restricted than they really are," Murchie said. But the newobservations, made with MRO's Compact Reconnaissance Imaging Spectrometer forMars (CRISM) and detailed in the July 17 issue of the journal Nature,reveal "thousands and thousands of outcrops that we can now resolve withthe higher resolution of the instrument, and they're scattered all over theplanet wherever the older rocks occur," Murchie told SPACE.com. "Whatthat's suggesting to us is that we're seeing a pervasive subsurface layer thatgoes back in time ? it's been altered by water to clays and related minerals,and it's outcropping all over the place," Murchie added. The layerof water-altered rocks sits below younger, volcanic rocks and the ubiquitouswindblown Martian dust and sand in many places. But in craters and scarps,including Valles Marineris, across the terrain of the southern hemisphere, theancient clays and other minerals have been exposed. "It'slike going to the bottom rock layer in the Grand Canyon," Murchie said,where ancient layers underlie the whole area, but are only exposed in a fewplaces. Thislayering gives scientists a dividing line of about 3.7 to 3.5 billion years agofor a transition in Martian geology: "Before that the rocks were alteredinto clays, since then they're not," Murchie said. The varietyof clays and other minerals formed also tells scientists that rock was alteredby water under a variety of conditions. "There'sa variety of environments that are formed where the rock was lightly alteredwhere you see things like chlorite, to where it was altered with water atreally high temperature, where you see mica, to where a lot of water must haveflowed through the rock in order to dissolve out the iron and magnesium andyou're left with kaolinite," Murchie said. Thealteration of later rocks, such as the sulfates found by the Mars Exploration Rovers (MER),Spirit and Opportunity in the northern hemisphere, on the other hand, formedunder much more restricted conditions. Oneimplication of these findings is that some of the environments that formed thephyllosilicates would not have been antagonistic to any potential life, unlikethe conditions that formed the sulfates, which formed in a highly acidicenvironment similar to battery acid, as Murchie put it. Whether theMER rovers can get a close-up peek at these phyllosilicates while the robotsstill roam the Martian surface is uncertain, Murchie said, because so far therocks haven't been detected near the crafts. But they could be there and simplybe obscured in the north from the MRO instruments by dust. "Itdoesn't take much to hide something from our optical instrument in orbit,"he said, just a few micrometers of dust. "So just brushing away the rocksurface could be enough," he added. Whether ornot Spirit and Opportunity get a chance to investigate these intriguing rocksup close, future rover missions, such as the MarsScience Laboratory set to launch 2009, could certainly be aimed at knownphyllosilicate-rich sites, Murchie said, shedding more light on the mysteriesof early Mars.